Alicia “AJ” Petross is a leader in diversity and inclusion. As Senior Director Global Culture, Diversity and Inclusion, and Engagement at The Hershey Company, AJ has a track record of success in building trust throughout the organization and leading new and exciting approaches to diversity and inclusion. Because of Hershey’s exemplary employment practices for people with disabilities, the National Organization on Disability recently named the company a 2017 NOD Leading Disability Employer. NOD recently sat down with AJ to find out what drives her passion for workplace inclusion—and how Hershey’s is leading the way. 1. What led you to choose a career in diversity & inclusion? From a young age, I remember my father helping a relative of ours to gain employment. She suffered from narcolepsy and was plagued by psychiatric boarding even though her disability was manageable. My father removed her from facilities by finding her employment, which meant she could regain independence. Having a job meant everything. The opportunity to earn a living is vital for everyone of working age. Having a disability should not prevent people from being employed. Seeing her journey was a powerful experience, one that stayed with me and influenced my career decades later. 2. What influences your commitment to diversity, as you continue to build a culture of inclusion at Hershey? At Hershey, diversity and inclusion is a commitment that is ingrained in who we are. It’s about advancing our vision, our culture, and our environment so everyone can bring a meaningful contribution to the table. We have comprehensive strategies for diversity representation and retention and for making diversity a cornerstone of our corporate reputation. We cannot be innovative without diversity of thought. That’s why the diversity of our C-Suite is intentional. Changing demographics, socio-economic trends, technology and globalization are converging on our workplace and marketplace like never before – and 85 percent of consumer-packaged goods purchases are made by women. At Hershey, our gender representation in C-suite roles is peer-leading and very influential to inclusion at our company. Women are at the helm of The Hershey Company’s most profitable businesses and hold powerful C-Suite positions. Examples include: Michele Buck, who became the company’s first female CEO earlier this year, other top ranks such as our Chief Financial Officer Patricia Little and General Counsel Leslie Turner and the leaders of the Hershey’s and Reese’s brands, Melinda Lewis and Veronica Villasenor. As important as the diverse perspectives of our C-Suite are, we’ve learned that their actions continue to improve the diversity and inclusion of our workforce. Diversity, inclusion, and culture are incorporated throughout our company strategic plans, our corporate vision and values, and our global Hershey leadership behaviors. We will continue to use this foundation as we advance our culture of inclusion at Hershey. 3. What impact has Hershey’s inclusive efforts made on the neighboring community? The company? Hershey dedicates time and attention to civil, human rights and social justice issues. Most recently, efforts in this space resulted in a facilitated dialogue session with local business and civic leaders to discuss the marginalization some have experienced in the local community and at the national level. The dialogue focused on reaffirming our commitment to fostering a culture of respect, safety and acceptance within the greater Hershey community. Whether hosting Former Pennsylvania Governor and National Organization on Disability Chairman Tom Ridge for a disability awareness education session with employees or signing Hershey’s commitment for the Federal Equality Act, we work to ensure we are actively committed in our attention to civil rights, human rights, and social justice issues. Another example includes our participation in President Obama’s White House Equal Pay Pledge, First Job Compact, and Fair Chance Pledge, which highlighted Hershey’s commitment to creating a contemporary workplace. Through these initiatives, we built a commitment to equal pay for equal work, giving more people opportunities to gain experience in the workforce and eliminating unnecessary employment barriers. Hershey’s investment in the communities where we do business is important and enduring. I am proud to work for a company that is visibly committed to inclusion. 4. Why is it important for The Hershey Company to support the National Organization on Disability? Can you share an example of any programs that support disabilities? The Hershey Company has been a proud member of the National Organization on Disability’s Corporate Leadership Council for 5 years. 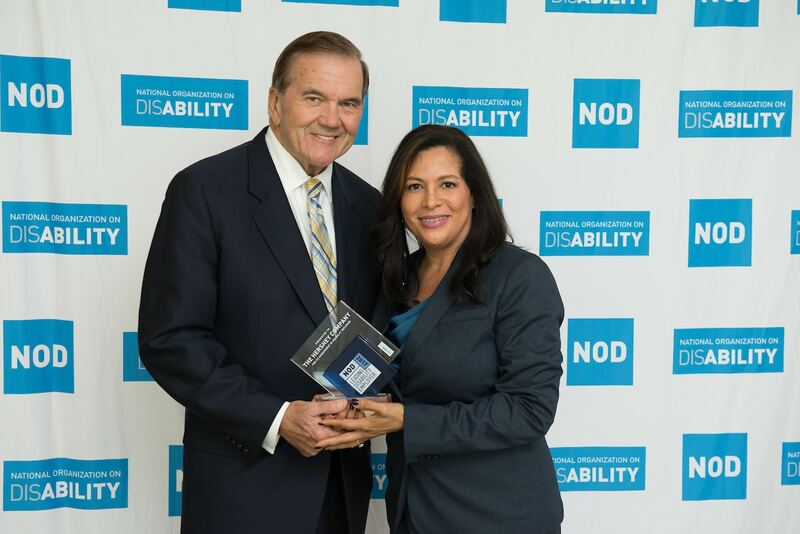 We value our partnership because NOD is a leader in disability inclusion. Hershey’s purpose is bringing goodness to one another and to the world. As I mentioned earlier, being able to be employed regardless of ability is essential. Another example is our partnership with Susquehanna Service Dogs, which trains service dogs on the company’s campus. This raises awareness on our campus, which contributes to our “disability friendly” environment. 5. What’s next in Hershey’s commitment to diversity & inclusion? Hershey is partnering with the Office of Vocational Rehabilitation on a Food Manufacturing Training Curriculum for Individuals with Disabilities. We are in discussions about developing programs that expand our pipelines for qualified candidates for potential hiring into manufacturing roles and retail positions at Chocolate World. Our hope is that our partnership will drive disability hiring in food manufacturing beyond The Hershey Company across Central Pennsylvania. Learn more about The Hershey Company.